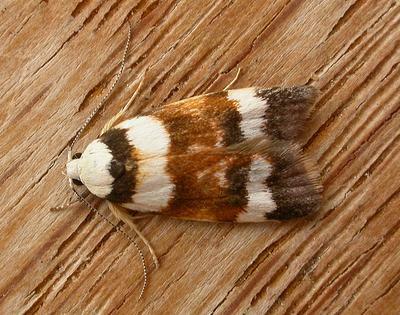 The moths of this species have forewings that are white with a black margin and base, and have a black-edged white or brown band across the middle. The hindwings are plain brown. The wingspan is about 2 cms. CSIRO Publishing, Melbourne 1994, pp. 281, 283-286. Volume 20 (1895), pp. 5-6.